Born in 1961 in Medellin, Colombia where he lives. 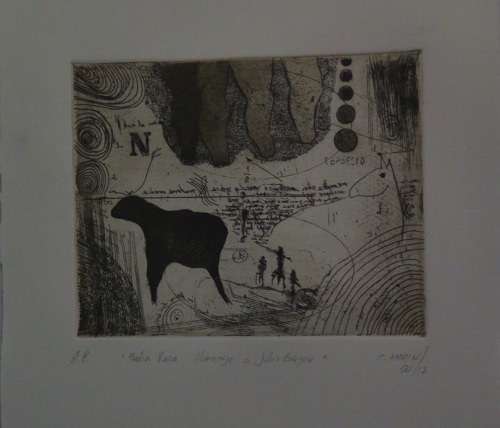 He studied Fine Arts at Fine Arts Institute in Medellin, etching and printmaking techniques in "Museo de Antioquia" and " La Estampa" printmaking workshop in Medellin. "Spaces intervention with graphic techniques" at " Casa de las Americas" with Antonio Martorell in la Habana, Cuba. Silkscreen and pictorial techniques at "Da´Vinci escola d´art" in Barcelona,Spain. He shows his graphic work since 1999. In which he uses ma Read Moreinly traditional techniques like dry point, etching, aquatint, linocut and woodcut. Recently he started to combine these in experimentation with new techniques. He has shown his works in several countries like: Cuba,Mexico,Ecuador,Peru,Spain,Ireland,Portugal, Canada, Belgium, United States, Netherlands, Japan among others.